This beautiful corner of northwest Wisconsin is closer than you might think. It’s also a great place to get more for your money. Although I’ve helped connect buyers and sellers all over Douglas, Bayfield, Washburn, and Sawyer Counties, I’d especially like to tell you about my home neighborhood. It includes communities like Gordon, Wascott, Minong, Barnes, and Solon Springs—plus dozens of deep, clear lakes that are great for fishing, boating, paddling, or wildlife watching. Some of the larger, better-known lakes include the Eau Claire Chain of Lakes, the Minong Flowage, Whitefish (Bardon) Lake, the Gordon Flowage, Upper St Croix Lake, and Lake Minnesuing. Here in this quiet, undiscovered corner of Northwest Wisconsin, you’ll generally get a lot more for your money. In many cases, the same dollars will get you more home, more cabin, more shoreline on a clear, deep lake, or more acres of great hunting land. And for most buyers coming from the Twin Cities, Eau Claire, or Duluth, we’re actually much closer than more well-known destinations like Cable and Hayward. We’re a little farther north, but not nearly as far east. 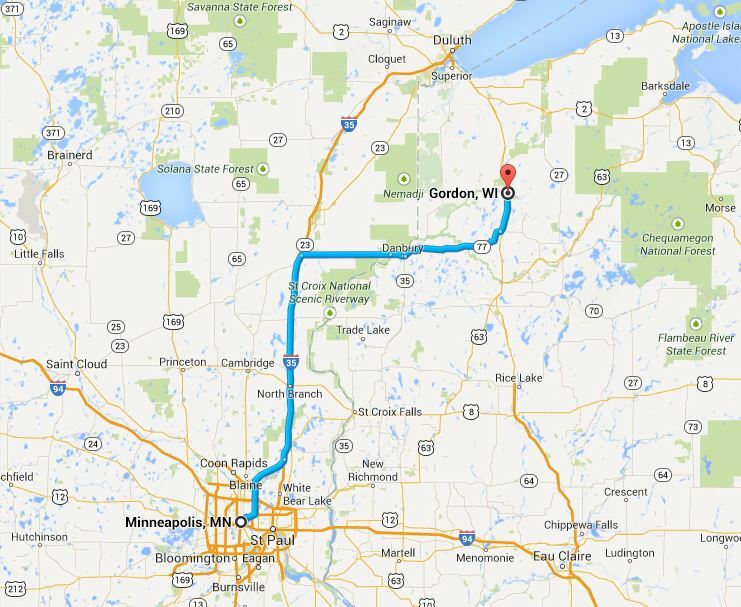 Here’s how it works: From nearly anywhere in the Twin Cities, the fastest way to reach this part of northern Wisconsin is to take 35 north and turn right at Hinckley. At the WI border MN 48 changes to WI 77, which you’ll continue following eastward to Minong. From there, it’s another 3 miles to the Minong Flowage, 9 miles to Whitefish Lake, and 24 miles to the Eau Claire Lakes. The bottom line: We’re closer than you might think—about 2 hours 30 minutes from St Paul or Minneapolis, 2 hours 20 minutes from Hudson or River Falls, 1 hr 45 minutes from Eau Claire, and 60 minutes from Duluth. For a map showing how to get here from any of these starting points, just click on the drop-down menu. *An exception might be if you’re driving up from eastern suburbs like Stillwater, Hudson, or River Falls—and maybe even Woodbury. Then, even though you’ll be traveling two-lane roads that pass through several small towns with stoplights, you’ll want to head east on 94, then northeast through Wisconsin. But even by that route, Minong, Wascott, Gordon, Solon Springs, and Barnes are all closer than Hayward and Cable or about the same distance. Looking for a lake home, cabin, or waterfront real estate NW Wisconsin? Give me a call at 218-590-6634. Or, you can reach me at jeanhedren@edinarealty.com.